LEAP Into Your Managerial Career! 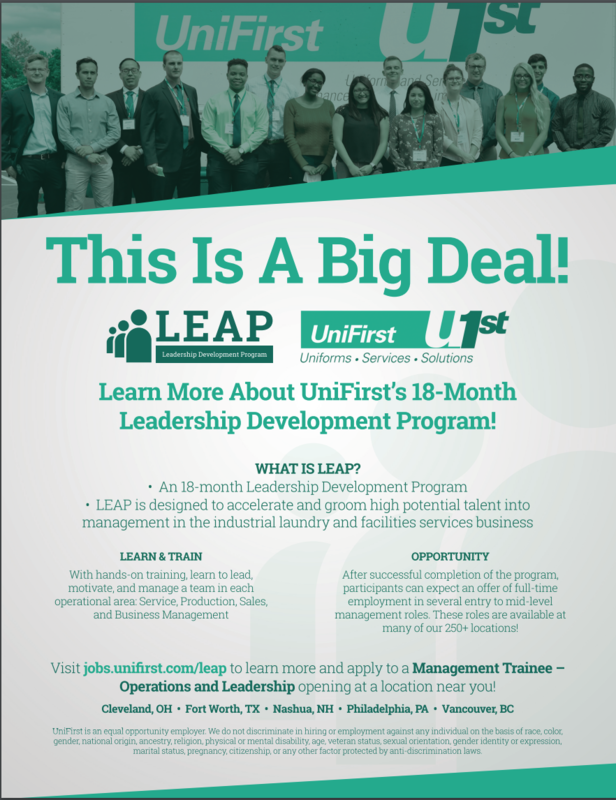 Calling all senior management or sales majors, if you are interested in a leadership development program, UniFirst’s LEAP program is something you should consider! LEAP is a full-time 18-month program for highly motivated students who are seeking a career in management. Once accepted into the program as a cohort, Associates will rotate through four operational cycles; Service, Production, Sales, and Business Management. Upon successful completion of the program, Associates can expect an offer of employment in a variety of entry to mid-level managerial roles at one of our 250+ locations. For more information, reference the flyer to the left. You can also learn more about this opportunity by visiting their website. They are recruiting for two openings in Nashua, New Hampshire. If you are interested in this opportunity, please apply to a Management Trainee – Operations and Leadership opening by clicking here or via BentleyLink.